I am quite discerning when it comes to my camping chair and when I get the opportunity to actually sit down and relax, I want something comfortable. For the past 10 years I have been using my trusty recliner camp chair, which I purchased when nursing little babies and needed something that was adjustable. Although it is comfortable, it weighs almost 3kg, it is very bulky and demands a lot of my precious packing space. My requirements have now changed and this time I was was keen to buy a chair, which was more compact and easy to pack but still just as comfortable as my old favourite. After seeing my friends Helinox ‘chair one’, I was keen to give them a go. Helinox believe their chairs are the ‘best quality in the world’ and to avoid distribution and advertising costs, they sell direct to the public through their online store. The biggest problem I had was trying to decide which one of the five styles suited me best. After trawling through their informative website, I still couldn’t decide so I called Helinox to discuss the available options. With much deliberation I went for their biggest and heaviest, which is the sunset chair. But at just over a kilogram and still able to tuck into my shoulder bag, it was a huge leap forward for me. My main use is car camping, fishing trips and outdoor activities but not so much lightweight hiking, so the sunset chair suited me as it is elevated from the ground and has a high back. I like to rest my head when sitting by the campfire at night and the chair packs into a small tote bag which doubles as a headrest. All you need to do is roll up a towel or jumper, put it in the bag and attach it to the Velcro. I ordered two chairs so there weren’t fights between Ashley and I and they were on my doorstep the very next day. It was a surprise to see how small they were in the bag and even though I ordered the biggest chair in the Helinox range, it is extremely light and very quick to set up. 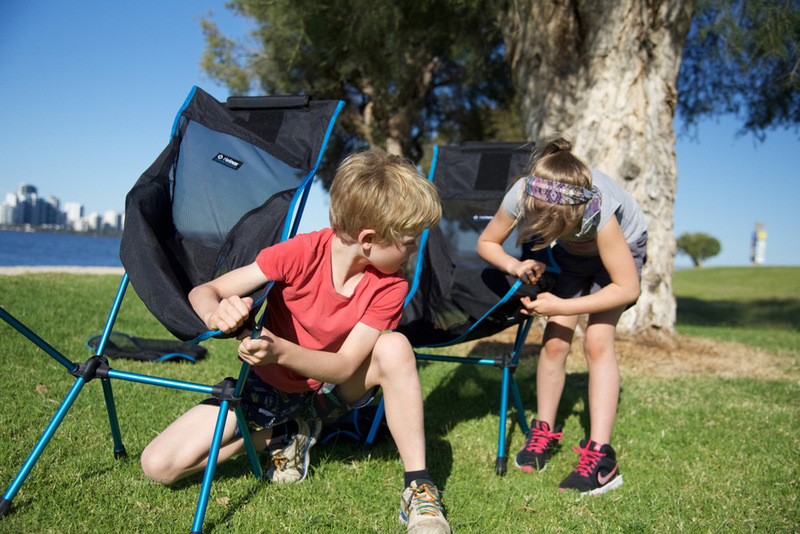 Often it takes a bit of skill and more brute strength to remove camp chairs and pack them back into their bags, a chore my kids find very difficult but the Helinox chairs are great. It takes me less time to get mine out of the bag and have it set up than it does for me to wrestle the kid’s chairs out of their very tight bags. If two seven-year-olds can have them out of the bag, set up in about 30 seconds then you know they are quick and easy, the only element they sometimes need a hand with is attaching the last bit of the seat onto frame. I also like that the tote bag is generous enough that it doesn’t matter how you put the frame and cover into the bag, there is always ample room for the zip to do up. It’s been two months since I have had my chair and I really love it. It is comfortable and so small that my chair now lives in the car. For all those times, I wish I had something to sit on, I never need to worry because it goes with me everywhere and I can easily put it in a backpack. The chair is really comfortable but it is also so light that it can be susceptible to being blown over in the wind. Helinox recommend if it is windy to use the tote bag as ballast, put something weighty in the bag and thread it over the chair legs. While I love my new chair, there are still some elements I miss from my old clunker. The extra thick padding on the seat was warm in winter and I liked having somewhere to put my cup of tea as well as an armrest. Helinox do however make a nifty 600gm table so I might need to invest in one of those in the future. I have been really happy with my sunset chair and I am going to upgrade the kid’s chairs to a Helinox camp chair in the future. Whist you pay a premium for Helinox products, you definitely get what you pay for. The sunset chair can hold a massive 145kg and Helinox stand by the products they sell. They only use high quality components and offer a 3-year guarantee and a full refund if you don’t like them (as long as goods are unused).